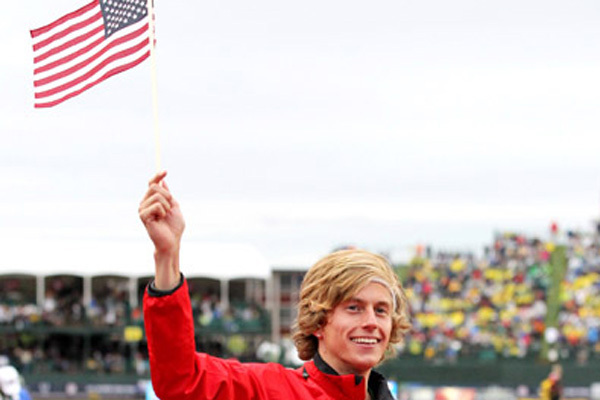 Evan Jager celebrates after making the 2012 Olympic team in the steeplechase. The defending champion is one of eight KIMbia runners competing at the U.S. trials in Eugene. KIMbia will be out in force when the U.S. Olympic Trials get underway Friday in Eugene, Oregon. Eight runners will try to earn a spot on the team for Rio. If they do, they’ll join the three KIMbia runners already booked for the Games: Amy Cragg and Shalane Flanagan on the U.S. marathon team and Tom Farrell on the British 5,000-meter squad. Below are the eight KIMbia runners who will compete in Eugene, listed by when their first race of the meet is. The complete meet schedule is here. German debuted at the distance earlier this year and has a lot of upside in the event. Last year’s world bronze medalist seeks another global berth. Emily has also declared in the 5,000. The defending Trials champion is a heavy favorite to repeat. This year’s NCAA champion will make her pro debut on Independence Day. Colleen finished 12th at Worlds last year and won last week’s Stumptown Twilight 1500. Lopez is seeking his third Olympic spot. He ran the 1500 at the 2008 Olympics and the 5,000 in 2012. Jess is the 10th fastest qualifier in the event and has the Olympic standard. The NCAA runner-up will face a wide-open field.